Quick Review: Jasper is from a rich and influential family and despite Ana’s condition, wants to be with her. The authorities grant Ana a tentative reprieve. If she is joined to Jasper before her 18th birthday, she may stay in the Community until her illness manifests. But if Jasper changes his mind, she will be cast out among the Crazies. As Ana’s joining ceremony and her birthday loom closer, she dares to hope she will be saved from the horror of the City and live a ‘normal’ life. But then Jasper disappears. Led to believe Jasper has been taken by a strange sect the authorities will not intefere with, Ana sneaks out of her well-guarded Community to find him herself. Her search takes her through the underbelly of society, and as she delves deeper into the mystery of Jasper’s abduction she uncovers some devastating truths that destroy everything she has grown up to believe. 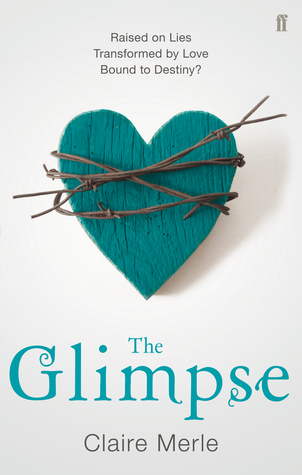 The second and final part of The Glimpse Duet will be available in June 2013. Detailed Review: What do I love about this story? Hmm... I thought this book was absolutely good - clear story and easy-going characters (except the fact that the main character, Ana is going crazy). The start of the story is the start of a girl called Ana who is a sweet girl. Well you know... The girl who's always good, listens to her dad, takes their advice and tries not to get noticed. Until the day that crushed her identity. Ana then gets sent to the headmaster's room and finds out she's a Sleeper. One small step to the big disease - An Active. An Active is someone who has a psychiatric problem, a mental disorder. Ana is yet on the verge with herself being one. It kept me thinking about it's mysterious plot and sole adventure of Ana, how she delves deeper into her past of her family and into the abyss of the Crazies world. ANA - she's a girl whom you can trust-ish. Living in the world she sees now, there's no going back to; playing princess, living the large life, falling in love with someone who she doesn't love anymore. Now Ana is the girl who is fighting for everything she wants and more. The boy who has stepped into the present. JASPER - a boy living in the high end, he is simply betrothed to lovely Ana. Until he disappears into the world where old men fear little girls. Shockingly, he mysteriously wanders into a Crazies's world, why? He found a secret that could topple the empire, the world's enemy - Ana's father. He's being electrocuted, tortured and many other ways to make him talk. What will happen then? Will he resist the unresistible? COLE - he's seen something through The Glimpse. A project in which allows you to see the future. At the same time, he gets captured by a group who wants Jasper as well and brought to court. There he meets Ana for the first time - the person who he's going to love and already has - you'll see why... As he helps Ana - his 'soul mate' - through the spiralling world of The Crazies - she has started to see through her eyes where the impossible is the possible with a little help from Cole himself. I thought that the author's writing was very fluid as she tells the stories of her characters. I especially loved the main character, Ana - she was a really good and developed character from a girl who lived in the rich world to a world that she has never imagined. It was funny to see how the character's personality changed within one book. From Quiet Ana to Wild Ana, there we finally see the whole plot developing as well as the romance between Cole, her 'soul mate'. 'Her dressing gown flew apart. Her hands burnt as they rubbed the rope. Her heart leapt wildly. I was really excited at the end! I am desperately waiting for more - check out for the second book, The Fall where Ana and Cole takes another leap into adventure, romance and many more!